Grace Sheppard who was married to David Sheppard, cricketer and archbishop, was distinguished in her own right. The introduction to her memorial serviced briefly describes her life. There’s a tragic irony in the title of her book from which this session’s extract comes. Five years after the death of her husband, she herself was diagnosed with inoperable cancer. As she says, it was her ‘turn now to experience the vulnerability that leads to the need to lean on others’. 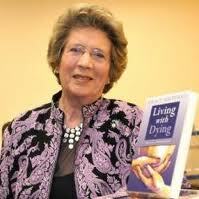 She was now ‘Living with Dying’. Well I can only speak about my experience of suffering. I’ve seen and heard so many people with cancer who are and are feeling negative and I would never ever blame them. I would feel very sad for them but I can only say that I’ve been given the gift of seeing the glass as half full, not as half empty, and that’s why I go on being thankful. There’s a huge power in gratitude and I don’t mean the kind of politeness we were taught to show, just to say thank you and move on. I mean once we start to itemize what we’ve been given, then it becomes a habit to say and to be thankful and I found that I didn’t have to look inches away to see things that I’m thankful for. I look over there and I see pictures of my grandsons and my daughter, flowers that somebody’s brought me, a drink that will help me quench my thirst. All these little things mount up and you think ‘My goodness, aren’t I blessed’ and to me all these are gifts from God – that’s my particular take on these things and it helps you deal with the suffering, it helps you do the hard bits and I hope that in some way my experience of this will help just one other person to find a positive way through. It is in the tenderness of an elderly man that I saw in hospital patiently tending his dying wife day after day: in the way the light falls on the plants in my garden: in my little next door neighbour jumping on the trampoline, with arms outstretched, shouting ‘I can reach the sky!’: in the robin puffing out his chest in the early morning sun: it can be found in the way food is prepared and presented on a plate: – and yes, even in the company of a close friend enjoying ‘Strictly’ on a Saturday night. We are each other’s gifts. I’m thankful for every life-giving encounter. Today I stand here out of sheer gratitude:gratitude for Life; to God; to my family and friends and neighbours; to everyone who has sent cards and messages and flowers and offers of help; to all in the NHS: doctors, consultants, nurses, Macmillan nurses, district nurses, researchers, administrators, chaplains, secretaries, maintenance engineers, phlebotomists, radiologists, dinner staff, tea ladies, auxiliary staff, porters and volunteers. They are part of us and we are part of them. Thank you too to all who have been praying – I can feel it every day. There is healing power in Gratitude. See also further information about the soul friends about which Grace Sheppard writes.